Refractory. Cracks and other surface artifacts may be caused due to the exposure to high temperatures. Regular visual inspections and careful examinations are key to preventing significant damage and preemptively initiating repairs. The refractory may simply fall off and the shell be will unprotected from the heat. The Burner. Ensuring that the burner is operating properly is crucial for the equipment. Seals. Some reactions should be conducted in a completely closed environment and properly-shaped seals ensure that there is no air leakage during the process. 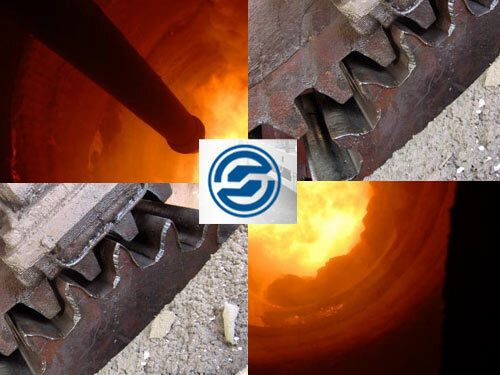 However, high temperature can cause slight deformation and compromise the integrity of the process. Inspect seals regularly. Alignment. Ensuring that various components of your equipment are aligned perfectly is vital for successful processing and reducing wear. When wheels, girths, and the kiln are misaligned, the wear is significantly higher. Regular inspections are the key to prolonging the life span of your pyroprocessing equipment. Maintenance procedures should include both visual inspections and regular adjustments of the equipment.